Description To connect with spiritual forces during a ritual, shamans wear masks and headdresses. Originally brightly painted, the headdress of this man is in the form of a composite beast, with a bat’s face and a jaguar’s fangs, referencing some of South America’s most awe-inspiring animals. 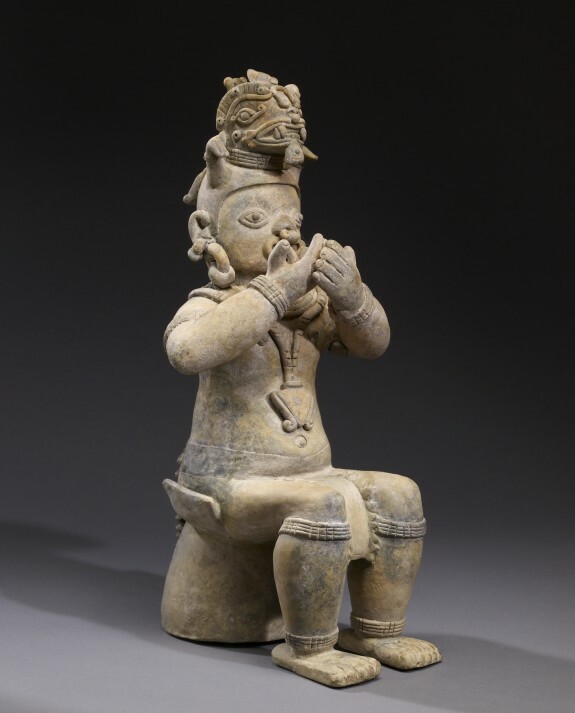 This shaman is about to inhale hallucinogens, initiating a ritual during which he aimed to communicate with animal spirits and mediate his community’s needs. The crocodile-like tail affixed to his belt may reflect the belief that spiritually powerful people can transform into animals. Crowning Glory: Art of the Americas. The Walters Art Museum, Baltimore. 2018. Provenance Fine Arts of Ancient Lands, New York; Herbert L. Lucas, Los Angeles; Ancient Art of the New World, New York; purchased by a private collection, 1992; given to Walters Art Museum, 2009.